Apparently it’s still snowing in some places. CRAZY. It’s even chilly and drizzly here in San Diego (don’t worry, I am not complaining), so I think we’re all probably in the mood for some cozy food. My sister-in-law Cora made beef stew for the family this past summer and it was sublime. I make a pretty good beef stew, but hers was definitely better. I finally got around to bugging her for the recipe and, as usual, she obliged. She’s good like that. Cora sort of follows Ree’s seef stew with beer and paprika recipe but changes a few things up. I followed her lead and ended up with this most delicious stew. The sauce is so rich in flavor, the meat so tender, the veggies cooked to perfection. 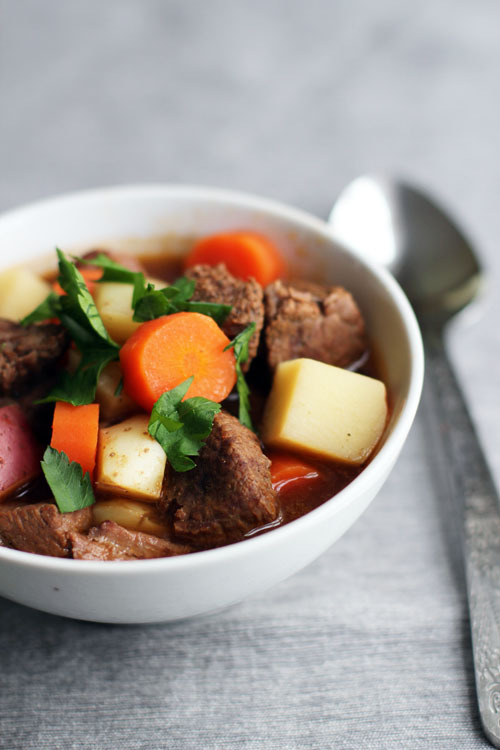 Yes, it’s called Boozy Beef Stew. 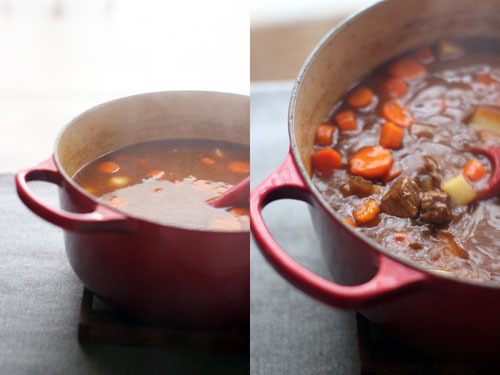 Because there are two bottles of beer in the pot and how can you not name it Boozy Beef Stew with all that beer involved? Never fear, it doesn’t taste like a bottle of beer with a few chunks of meat thrown in. It just tastes good. So good. Also, this recipe gives me an excuse to use one of my most favorite items in the kitchen – a bottle opener we got from Nate’s great-grandma Rose’s home when she moved into assisted living at age 99. We don’t drink around here, so this cute little bottle opener doesn’t get much action. But when I do take it out, it always makes me happy. Now, go booze up your beef. Adapted from a recipe by Ree Drummond by myself and my sister-in-law Cora, who rocks it in the kitchen. In a large soup pot or dutch oven, heat a few swigs of olive oil over medium heat. Add onions and cook until translucent. Sprinkle beef evenly with salt and pepper right in the package (just on one side). Once the onions are cooked, turn the heat up a bit to about medium-high and add the meat to the pot, dumping the meat face down so the seasoned sides hit the bottom of the pan. While that side is browning sprinkle the unseasoned sides of the meat evenly with salt and pepper. Brown both sides of the meat. Add garlic to the pot and stir. Pour the beer, boiling water and beef bouillon/concentrate into the pot and mix well. Add the Worcestershire sauce, tomato paste, paprika and sugar. Stir to combine. If it's not already boiling, bring to a boil then reduce heat to low so that the soup is simmering. Cover the pot with a lid and simmer for 2 to 2½ hours. Make sure it's simmering throughout the cooking process (I had to adjust my heat up and down a few times during the 2 hours because my stove is funky like that). Remove the lid, raise heat to medium and add the carrots and potatoes. Simmer for another 20-30 minutes, until the veggies are tender but still firm. You may need to reduce the heat to medium-low during this final simmer. You don't want it totally boiling, just a nice simmer. Taste and add salt and pepper as needed. Serve topped with fresh minced parsley, if desired. This is just what we need for our rainy, almost warm, weather! Looks yum! This looks SO good! And I love that you have that bottle opener! I have some measuring spoons and cups from my grandma who was a whiz in the kitchen, and I think of her every time I use them. Love it. I just love those little things from loved ones from the past…it’s the best. 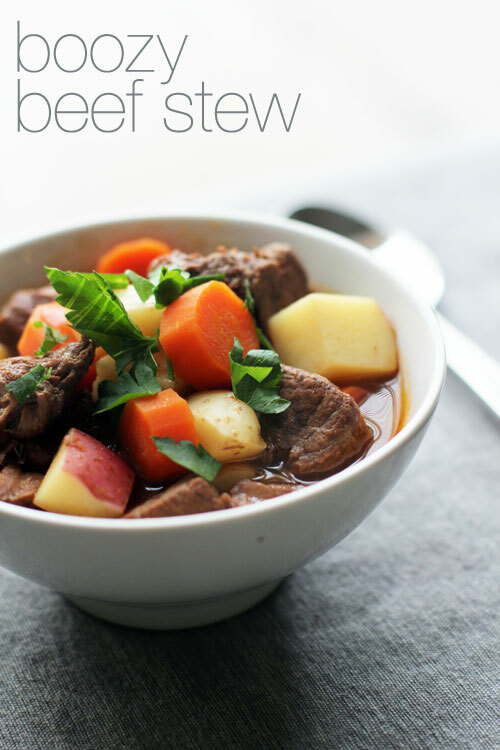 I was honestly just wishing I had a good beef stew recipe! Thank you so much for reading my mind. This looks amazing. I’ve tried some of Cora’s other recipes so I know this will be delicious! I bet Peter would LOVE this. I have been appreciating boozy foods more, particularly the savory ones. I already loved booze in desserts. 🙂 Stumbled this! it really can add some great, deep flavor to so many things! thanks for the stumble, dionne! They’re forecasting a spring snow storm. This would be perfect! will it never stop?!?! 😉 good for those ski resorts! We had snow this morning, so yeah, this looks like the perfect comfort food. Oh dear me, that looks amazing. 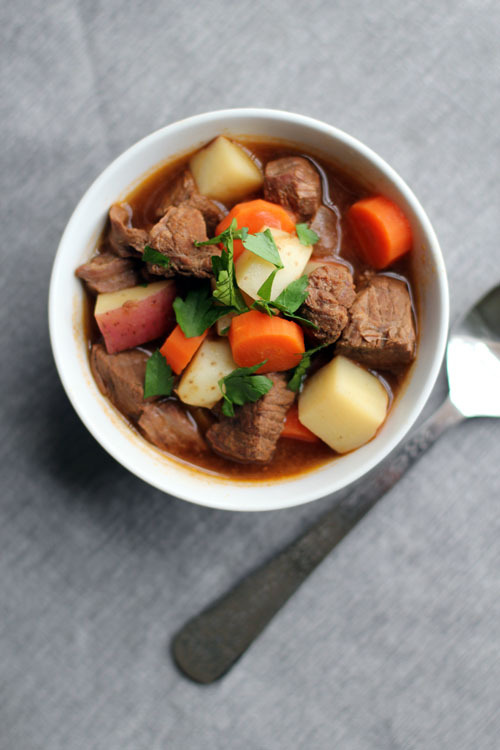 I adore beef stew. It’s absolutely perfect comfort food, especially in winter, which, yes, refuses to end. Although … It seems to have let up down here. i can almost smell it from here! MMMM! 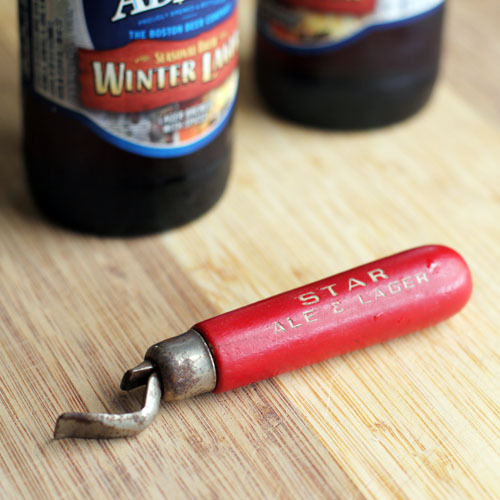 Perfect timing for beef stew…we’re one of the lucky areas with snow in the forecast tomorrow :/ And I LOVE the vintage bottle opener! Can’t wait to make this! It would be perfect on a lazy Sunday! 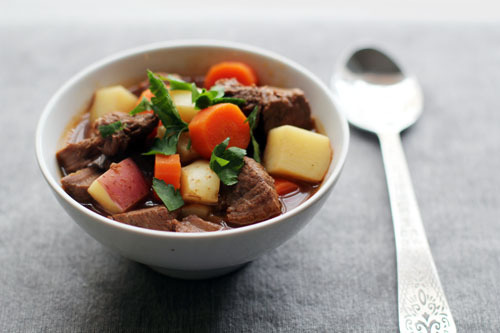 This looks great and I am in the mood for beef stew! Will try as we have a winter blast happening here tomorrow !